I hope this little bit of information will help you save time and money while repairing your vehicles. 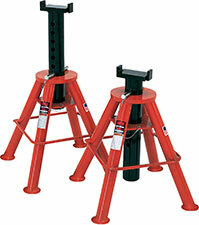 I'd like to take a few minutes to tell you how to safely operate our heavy duty pin-type jack stands. To use the stands, extend the support columns to the proper height adjustment as close to the vehicle as you can without the saddles touching the vehicle frame. Place the locating pin through the column holes, allowing the pin to rest on the collar on the top of the stand. Make sure that the locating pins are properly and fully engaged in the column's holes. NORCO... we make jack stands that work!